Anyway, regarding Drs. Cooley and Hitzig and their rebuttal, I say, fair enough. If they say plucked hairs don’t grow in any thinner, I have no reason not to believe them. But they still need to PROVE that the donor hairs (at plucked hair sites) always grow back. It seems they haven’t even addressed this point in their rebuttals. I’m not saying that they don’t, most of the time… but as Ahab so eloquently pointed out, it’s all right to assume that when plucking hairs out to REMOVE hair, but when plucking out valuable donor hair in areas where you need to PRESERVE hair, you need 100% proof that it will ALWAYS grow back, no matter what the plucking technique or the number of times those hairs are plucked. Otherwise the procedure has little utility and might actually make your situation worse. PLEASE NOTE that I’m not saying that I know that plucked donor hairs don’t grow back. I am not even saying that I strongly suspect they don’t grow back. I AM saying we need 100% hard proof on this… irrefutable VISUAL evidence. And so far, no one has given that to us. I think the other rebuttals by Drs. Cooley and Hitzig to Dr. Cole are fairly trivial and situational, and don’t really change things one way or another. Another HUGE, overarching question they have not even addressed – really the biggest question of them all – is, DO PLUCKED HAIRS CYCLE? Where is their answer to that one? Have they even volunteered to do controlled testing on this? As for ACell, they need to do controlled testing to evaluate the relative benefits of using ACell versus not using ACell. We need to see scientific, controlled experiments – side-by-side comparisons. You say that Dr. Cooley says that “plucked hairs will not grow without ACell”, or will grow only “very rarely” without ACell. Yet Dr. Hitzig says “plucked hairs do not grow back any thinner”, and cites “10 years experience” for this? 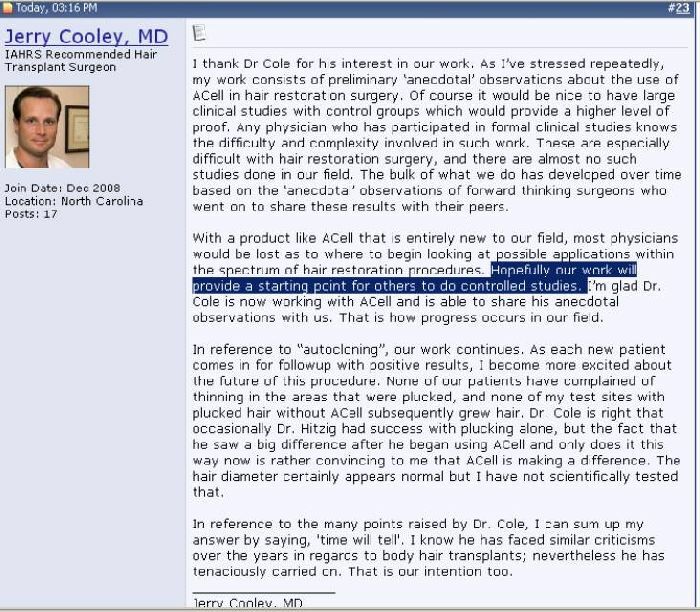 If, as Dr. Cooley says, plucked hairs will not “grow back” without ACell, then how do we reconcile that with Dr. Hitzig’s assertion that plucked hairs regularly grow back, over his 10 years’ experience, since, obviously, he was not using ACell on plucked hairs until a couple of years ago, at the earliest? Maybe the two doctors have differing definitions of what “grow back” means… maybe Dr. Cooley is setting the bar at, say, an 80% success rate, while Dr. Hitzig sets the bar at a 10% or 20% success rate in “growing back”. But, THEY ARE NOT TELLING US WHAT THEIR DEFINITIONS OF SUCCESS ARE. Exactly WHAT constitutes “success” in getting plucked hairs to grow back, doctors? Do you define “growing back” as a 10% success rate? 30%? 50%? Again, they’re using very subjective criteria, and they’re not even disclosing that criteria to us. There’s only one thing to do: be patient. As some many says… they’re tryng it now on some patients. If it really works good, we can sure know something about in the next months. Nothing else to do. Possible/ probable answer for you: When they say plucked hairs always or nearly always grow back I think they are referring to its origial site. When reference is made that they rarely grow back without Acell, I think they are referring to the transplanted site. Just my take, could be wrong. » There’s only one thing to do: be patient. Jop even if this will work just fine, people like rassman will complain about anything, it nature of humanity. » nearly always grow back I think they are referring to its origial site. » they are referring to the transplanted site. Just my take, could be wrong… ACCURATELY FRANK. e roger-that…. fuc#k yo#u idiot…because you would need you vary you vary you vary you vary times to have the procedure to pull out the hair givers? this thinking about implanting hair in the body all? son of a bitc#h. » they are referring to the transplanted site. Just my take, could be wrong. Dr. Cooley says plucked hairs only “grow back” with ACell. We know that these docs are using ACell at both the plucking site and the insertion site. Still, regardless of that, they should get it straight what they mean by “plucked hairs growing back” – if they are going to simultaneously come out with rebuttals to Dr. Cole, they should coordinate and agree on the terminology they’re using, what it refers to, and what experiments, testing, and observations they’ve made. If they are talking about plucked hairs growing back in the donor sites, they haven’t stated HOW they know the plucked hairs grow back. Dr. Cole pointed out that when you pluck hairs out of a dense patch of donor hair in the back of the head, it’s extremely difficult if not impossible to discern with certainty that the particular hair(s) you’ve plucked are growing back. HOW DO THEY KNOW THIS? And how can they leave such an important question to just “eyeballing” it and making casual assumptions? What from the word " WAIT" do you not understand? Do you believe those two reputable docs would come up with studies only concerning plucked haiurs from donor? Man this is really getting stupid right now, Histogen shows pictures with significant grow and people cry around, some docs try to improve ht in general and some morons keep crying. @roger_that - Which sentence or term or whatever of Dr. Cooley’s response didn’t you idiot understand?? NO - I did NOT know this! Where the hell they ever mentioned, that they applied ACell at the DONOR site during a “hair plucking” (autocloning) procedure??? Simply they DIDN’T! Because there is simply no need for that! Leeroy’s latest response may have not have been diplomatic but I have to say that I generally agree with him. I know of no plucking technique in the worldwide depilation industry that consistently kills the hair with a few plucks - such a technique would be worth millions - and I highly doubt people claiming it here will show evidence of one. Millions of women have been plucking facial hair again and again and again for decades - I quite simply don’t believe that male hair is less tough than theirs. I think there are some people on these boards who will deliberately obfuscate and misinform people about Dr Hitzig’s and Dr Cooley’s findings in order to limit the interest in what they are doing - personally I suspect that it might be in their HT business interests to do this. Edit: I should add that I know nothing about “Spanish_Dude’s” current situation and my post is nothing to do with him/her. One might as well conclude that pulling up crabgrass does not kill that crabgrass, because crab grass keeps growing on your lawn. It’s likely as women age, they sprout more and more facial hair. So as quick as repeated plucking might kill functioning follicles, additional dormant follicles would be waking up to grow hair for the first time. So there would be just as much hair as ever, and it would appear that plucking does not stop follicles from growing hair. That’s an extremely weak analogy, crabgrass is a stubborn rooting grass with an aggressive seeding pattern - hair follicles don’t seed other hair follicles continually - unless you are rewriting the medical books ??? This is hopelessly weak again, if what you were saying were true then a number of women NOT plucking their facial hair would end up looking like Father Christmas !!! Guess what - they don’t. Empirical, but sobering: "Other medical complications [of trichotillomania or compulsive hair pulling] include . . . permanent loss of hair"
Yup, we know this CAN happen sometimes when you pluck many many times - but such continual plucking is not required for Autocloning - so the point is irrelevant. What you should be showing is real evidence for the ability to consistently kill follicles by plucking them, not plucking them many times - please provide that - because I can find no evidence for it and the worldwide depilation industry seems to have a consensus - saying the opposite of what you are suggesting. » crabgrass, because crab grass keeps growing on your lawn. » follicles continually - unless you are rewriting the medical books ??? » It’s likely as women age, they sprout more and more facial hair. » plucking does not stop follicles from growing hair. » Father Christmas !!! Guess what - they don’t. » opposite of what you are suggesting. Ive been plucking my nose hairs for 10+ years now on a bi-weekly basis, and i know with very high certainty that the same hair follicles grow back, the hairs are stubborn and still grow after all these years. » that plucking does not stop follicles from growing hair. You’d really have to rip your hair out repeatedly for that to happen, it doesn’t happen by doing it once or twice. You’re talking about people who do that constantly for years on end. Sweet jeebus, some of you sound like you’ve never had a girlfriend, this whole hair plucking thing is such a mystery, lol. Women in their 20s wax all the time. My ex used to work in a salon, they would have no business if plucking hair disabled the follice after 2-3 plucks. They wax (read: rip the hair out from the root) every 6-8 weeks. » do that constantly for years on end. » whole hair plucking thing is such a mystery, lol. » plucks. They wax (read: rip the hair out from the root) every 6-8 weeks. » » do that constantly for years on end. » » whole hair plucking thing is such a mystery, lol. this is really getting silly… i think it is generally agreed upon that occasional waxing does not sufficiently damage the hair to stop it from regrowing. As a full head of hair can doubtfully be restored in a single session, restoring a full head of hair wld require a few rounds of donor hair plucking, over the course of several months or years. This would be equivalent to waxing once or twice a year… you dont really think that that waxing once or twice a year is sufficient to permanently preventing hair growth, do you?